A tangent here: A couple of years ago I finally got a juicer for Christmas - but it wasn't a top-of-the-line kind of juicer. It broke down again and again - or shall - I say it overheated. The thing is - it could juice soft fruits but it couldn't juice carrots and I love carrot juice. So I got rid of it. Today though, I was wishing I had a juicer to do the kiwi's. It was a lot of work to blend them and then transfer that pulpy juice to the sieve and then try and get as many of the seeds separate from the juice as I could. If you have a juicer, let me know, pretty please, how many kiwi's makes a cup of juice. Thank you. Then I added the cup of kiwi juice-pulp together with the simple syrup and juice from two limes - plus extra lime zest because I love the smell of lime zest. 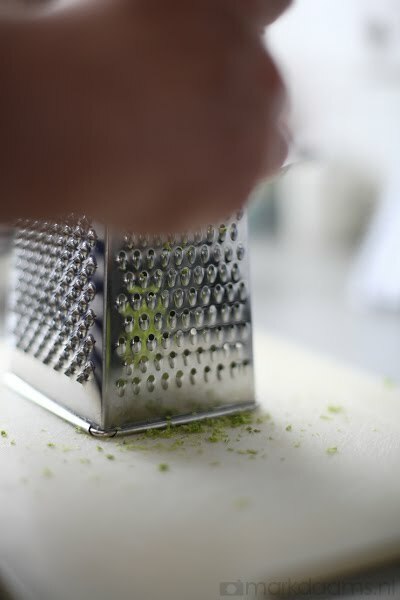 I wouldn't mind zesting limes on a regular basis... they smell so sublime! Mark happened to be in the kitchen while I was working and apparently the smell of limes drove him into a frenzy as well. He grabbed his camera and said - I would like to capture the smell of that on film. I think he did a pretty terrific job. To make simple syrup, combine 1 cup of sugar with 2 cups water. Boil for 5 minutes. Take off heat. Mix in 1 cup kiwi juice and pulp and the juice from 2 limes... and lime zest (optional). Freeze in metal container and half way through freezing process - about 4-6 hours - take out and blend with a fork. Then return to freezer and freeze until firm - about another 4 hours. 1. Heat oil in a 4- to 5-qt pot over medium heat. Add onions and bacon; cook 2 to 3 minutes or until onions are soft, but not browned. Add peas, broth, and 1/2 the lettuce. Cover and bring to a boil. Reduce heat, uncover and simmer 5 minutes. 2. Let cool slightly, then puree in batches in a blender until smooth. Return to pot, add remaining lettuce and stir over medium-low heat until warmed through. Top each serving with watercress. 1. Heat liquid butter or margarine in pot over medium heat. Add onions and fry until golden. Add peas, water, bouillon cubes, and 1/2 of the lettuce. Cover, bring to boil - reduce heat and simmer uncovered 5 minutes. Then with immersion blender - blend thoroughly. Add the remaining lettuce and stir through. 2. In a separate skillet fry up the tofu reepjes together with the BBQ sauce. Let fry until almost browning on all sides. Then add this to the finished soup and stir through. Ladle into bowls, serve with warmed pita bread or another really good soup bread to soak up all the yumminess.